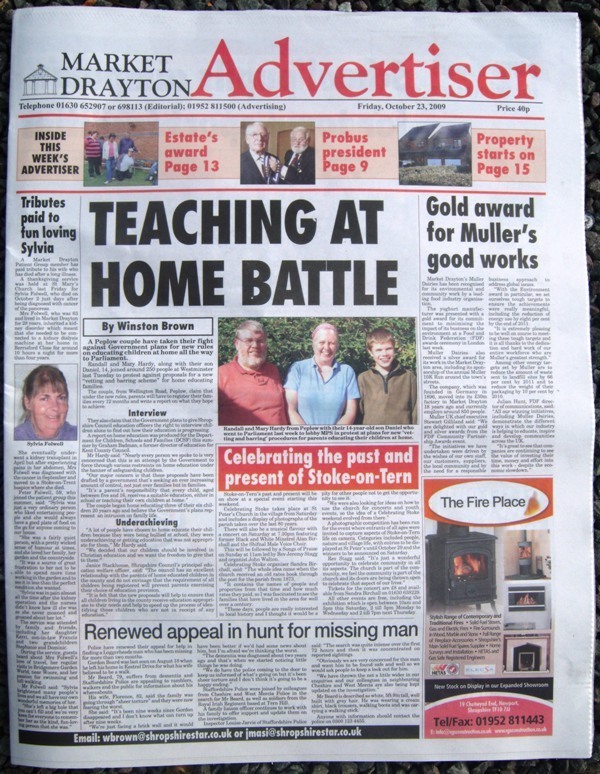 The week after the Mass Lobby of Parliament we were interviewed by a reporter from the Market Drayton Advertiser. We were amazed to find the report as the front page lead! A Peplow couple have taken their fight against Government plans for new rules on educating children at home all the way to Parliament..
Randall and Mary Hardy, along with their son Daniel, 14, joined around 250 people at Westminster last Tuesday to protest against proposals for a new “vetting and barring scheme” for home educating families. The couple, from Wellington Road, Peplow, claim that under the new rules, parents will have to register their families every 12 months and write a report on what they hope to achieve. They also claim that the Government plans to give Shropshire Council education officers the right to interview children alone to find out how their education is progressing. 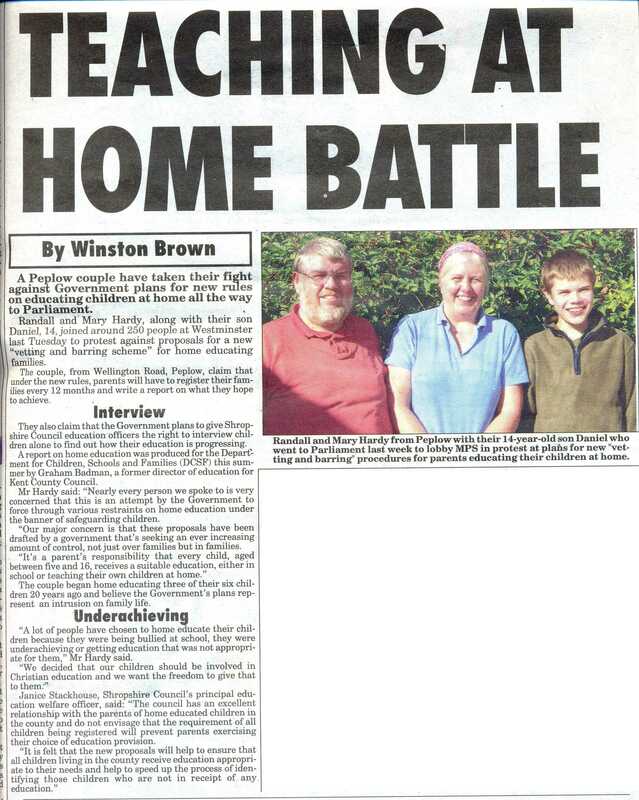 A report on home education was produced for the Department for Children, Schools and Families (DCSF) this summer by Graham Badman, a former director of education for Kent County Council. Mr Hardy said: “Nearly every person we spoke to is very concerned that this is an attempt by the Government to force through various restraints on home education under the banner of safeguarding children. “Our major concern is that these proposals have been drafted by a government that’s seeking an ever increasing amount of control, not just over families but in families. The couple began home educating three of their six children 20 years ago and believe the Government’s plans represent an intrusion on family life. “A lot of people have chosen to home educate their children because they were being bullied at school, they were underachieving or getting education that was not appropriate for them,” Mr Hardy said. Janice Stackhouse, Shropshire Council’s principal education welfare officer, said: “The council has an excellent relationship with the parents of home educated children in the county and do not envisage that the requirement of all children being registered will prevent parents exercising their choice of education provision.